The global market for cell culture media, sera, and reagents is climbing from a base of $3.7 billion in 2014, and will reach $7.1 billion by 2023. This projection, from Transparency Market Research, is consistent with an annual growth rate of 7.6%. Serum-based media have long dominated lab- and production-scale cultures. On the production side, particularly in the manufacture of therapeutic proteins, developers increasingly specify media that are free of animal components. Such media allow developers to avoid the risks associated with the contaminating or adventitious viruses that lurk within the genomes of expression cells. Regulatory risk reduction has been the driver for adopting animal-component-free media ingredients. Media developers have gone a step further with the introduction of chemically defined media, where the concentration of each component is strictly controlled. Chemically defined media, unlike fetal bovine serum, provides batch-to-batch consistency. Besides being embraced by developers, chemical definition is beginning to catch on with researchers. In the laboratory, chemical definition could help researchers achieve uniform media, consistent results, and lower costs. Many legacy bioprocesses still use media based on bovine fetal serum. For these bioprocesses, serum-based preparations retain their “magic sauce” status because they are associated with agreeably high productivity. Yet biomanufacturers do not live on productivity alone. “Biomanufacturing of therapeutic proteins eventually reached a productivity point where companies refocused their energies on consistency and quality,” says Chance Lai, associate director for product management at Thermo Fisher Scientific. Biomanufacturers are increasingly interested in batch-to-batch consistency. Also, developers of biosimilars are looking for ways to match the critical quality attributes of originator drugs. Consistency and quality concerns have sealed the deal in favor of chemically defined media, particularly for new products and processes. The trend toward lessening the emphasis on yield is strongest in bioprocesses that rely on CHO cell cultures, where the relevant conditions, growth factors, and feeding regimens have been worked out and standardized to the point where relatively little media optimization is required. Bioprocesses involving non-CHO cultures also reflect a growing appreciation of chemical definition. Vendors are responding with new products. In 2014, Thermo Fisher introduced a chemically defined medium for BHK-21 cells (CD BHK-21 production medium). Since then, the company started selling other chemically defined media for virus production. Consequently, top media suppliers source ingredients from well-known chemical/biochemical manufacturers, preferably in the U.S. and Europe, with the goal of satisfying multiple compendia. Raw material qualification therefore becomes more stringent for both consistency and impurities. With increasingly widespread adoption of single-use bioprocessing—a trend that is accompanied by growing concerns over extractables and leachables—media suppliers must ensure that their liquid products do not interact with the storage and shipment bags. Chemically defined media offer many advantages, but their downside is that attention is now turned toward variability in media ingredients and formulation, even when these components are “defined.” Customers therefore are demanding more data on the supply chain for these components, remarks Kevin Kolell, Ph.D., head of the cell culture franchise at MilliporeSigma. This has given rise to what Dr. Kolell calls “smart manufacturing,” which incorporates data analytics to help customers understand how media affects processes. This ties in with a renewed emphasis on process economics throughout development and beyond. 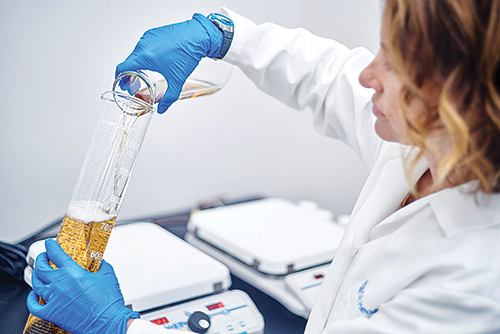 The improved consistency of chemically defined media has helped bioprocessors uncover previously unanticipated inconsistencies that were previously masked by variability in serum composition. It has also diverted attention toward impurities introduced through defined chemical components themselves, particularly trace metals. For example, iron is a standard medium component, but various grades of ferrous sulfate contain differing quantities of trace metals, among them manganese, which CHO cells require for glycosylation. But that need falls within a narrow range: too little manganese is as deleterious as too much. Combined contributions from impurities present in iron sources and other ingredients may alone supply more than the desired level of manganese. In-depth analysis of every defined medium ingredient for such impurities would be very costly and time consuming. Modern-day, complex, chemically defined cell culture media may contain more than 100 ingredients, each with the potential to introduce impurities that affect cell culture and/or protein quality. GE Healthcare uses a risk-based analytical strategy to identify high-risk materials that in the past have shown variability in levels of impurities. In the case of the trace element impurities, such as manganese, the company uses inductively coupled plasma-mass spectrometry to quantify impurity levels in the raw materials and final formulations. All top media manufacturers have extensive risk-mitigation strategies for assessing the quality of cell culture products. MilliporeSigma has instituted a program based on risk-based scoring of the 400 or so materials constituting its cell culture media. The company also maintains a global raw material management program, which includes initiatives to minimize product variability under supplier and materials qualification programs. Instead of containing poorly defined lipids, proteins, or other complex animal or plant factors, chemically defined media may contain unknown quantities of trace metals. To quantify impurity levels in raw materials and final formulations, GE Healthcare uses inductively coupled plasma-mass spectrometry. According to Angel Garcia Martin, Ph.D., CEO and founder of StemTek, stem cell culture medium must support both cell health and expansion, as needed, without promoting differentiation. “Stem cells,” he says, “are tricky because they are pluripotent by nature, with an ability to grow into different cell types.” Their very pluripotency makes stem cells unstable in culture. Vendors offer several stock pluripotency-inhibiting stem cell culture formulations. The type depends on whether the cells arise from embryos or adults, or whether they are of the induced pluripotent type. “Stem cell media formulations typically lack fetal bovine serum, which is undefined and typically includes factors that induce cell differentiation,” notes Dr. Garcia Martin. Serum has also been shown, by researchers at Dana Farber Cancer Institute, to provoke gene expression variability. Commercial media exist for cancer stem cells as well, which are StemTek’s specialty. The challenge is that these cells do not exist as pure cultures due to their constant differentiation into non-stem cancer cells. Some stem cells actually do require serum, for example, mesenchymal stem cells. “But users must test every batch of serum to ensure that it promotes growth,” Dr. Garcia Martin points out. As with cancer stem cell culture, mesenchymal cell cultures are rarely pure. Since the cells are destined to become bone, fat, or cartilage tissue, they usually exist as mixed cultures that continuously develop, expand, and differentiate. We’ve so far discussed stem cells used for research purposes. However, stem cells destined for cell-based therapies must be free of animal-derived components. Embryonic and pluripotent stem cells are typically maintained in a cocktail of growth factors, a major component of which is “knockout serum replacement”—a defined cocktail of supplements formulated to maintain pluripotency and inhibit differentiation. Cells are then treated with specific growth factors and cytokines to induce differentiation into the desired cell lineage. A typical knockout preparation consists of essential amino acids, vitamins, trace elements, and proteins, including components such as transferrin, lipid-associated albumin, and insulin. Serum-free Gibco™ KnockOut™ Serum Replacement, for example, supports the growth of embryonic stem cells and pluripotent stem cells cultured on fibroblast feeder cells. Parent company Thermo Fisher Scientific sells a less expensive version of the medium for research-only applications. Cancer stem cells have received significant attention recently due to their ability to replenish tumors, even those treated with radiation or chemotherapy. Part of the difficulty in culturing these cells stems from the fact that, according to Dr. Garcia Martin, “they’re not really stem cells, but cancer cells that acquire stem cell properties, many of them at the root of tumor malignancy.” He adds that it is striking to learn that several of the pluripotency-promoting genes are actually oncogenes. StemTek grows 3D spheroids that are enriched with cancer stem cells and are suitable for high-throughput drug screening. To create these spheroids, the company havests tumor tissue from human samples. Then it grows cells in suspension in a serum-free medium. Cells that survive grow into tiny tumor-like structures, or oncospheres. “Growth is restricted to cancer stem cells present in the population of cells within the sample,” notes Dr. Garcia Martin. StemTek’s product, Cell2Sphere™, provides oncospheres in 96-well plates suitable for drug screening or other experimentation. The manufacture of virus-based vaccines in animal cells calls for media that promote cell viability and infection, facilitate virus harvest, and provide predictable culture. Prospects for and interest in producing vaccines in immortalized cells waxes and wanes with pandemic scares, but sentiment clearly favors a virus expression system that does not rely on traditional egg-based processes. One such platform is the EB66 cell line, derived from duck stem cells and commercialized by French vaccine developer Valneva. EB66 is superior to animal cells for expressing common virus-based vaccines, according to the company. Twenty-four top vaccine manufacturers that have in-licensed the cell line evidently agree. EB66 was previously grown in “biphasic” culture media based on plant hydrolysates, which Valneva discovered resulted in unacceptable variability. In November 2016, Valneva announced that it had concluded a project with GE Healthcare’s Hyclone business unit. The project resulted in development of HyClone™ CDM4Avian, a chemically defined medium that specifically addresses previous variability issues. The medium supports production of secreted viruses such as the measles virus, influenza strains A and B, and alphaviruses.